For Stylight, a fashion and design retail search engine, uptime, performance and customer experience are key to the bottom line. With tens of thousands of new images being added to its site each week, and a very small development team, the company needed an efficient way to manage and manipulate images, so they could be viewed quickly and optimally on any device used by consumers in 16 countries. As one of the earliest users of Cloudinary, Stylight sees significant performance and financial benefits related to Cloudinary’s cutting-edge solution for image optimization and delivery on multiple content delivery networks (CDNs). Stylight, the leading aggregation platform for users and the fashion & lifestyle industry worldwide, helps online shoppers search more than 1,000 online shops featuring the best brands and retailers, compare prices of more than 30 million products and find all the best deals. Once users find the products they want, Stylight redirects them to the retailers’ websites to complete their purchases. In the early years, Stylight had a really small team developing the fashion search engine. They had quite a task in front of them, working with thousands of product images provided by multiple online shops and retailers, and making sure they all looked great and loaded quickly, so visitors were delighted with great image quality and great load time. After considering on-premises options, which would require the company to host and store its own images, the Stylight team decided to look for cloud solutions and discovered Cloudinary. “Cloudinary provided everything we were looking for – multiple image resolutions, scaling, quality optimization, and more,” he added, and so Stylight became one of Cloudinary’s first customers. Stylight uses a microservices based architecture, so it has a variety of teams that work hand-in-hand to integrate new shops with the site, add product information on the fly, etc. The team that enriches the products by tagging them to appear in the appropriate categories also is responsible for uploading the images into Cloudinary. The Product team which is responsible for the client facing parts of Stylight consumes a REST API including the Cloudinary image IDs and applies certain transformations via Cloudinary’s unique URL-based solution to ensure those images appear as intended on the site. One of the most important features of Cloudinary for Stylight relates to automation. Using automatic format selection and automatic quality compression, Stylight’s team is able to easily deliver the best image format, such as WebP for Chrome browsers, and optimal image quality based on viewport, bandwidth and other unique factors. The optimized size and format has “a significant positive impact on page load time, performance and visitor satisfaction," Hoyer noted. More recently, Stylight began leveraging Cloudinary’s multi-CDN capabilities, which dynamically switches between multiple content delivery networks – Akamai, Fastly and Amazon CloudFront. Leveraging multiple CDNs plays a critical role in ensuring optimal performance – serving images closer to Stylight’s end users to speed page load time. In addition, being able to switch between CDNs when needed prevents costly downtime of Stylight’s site. 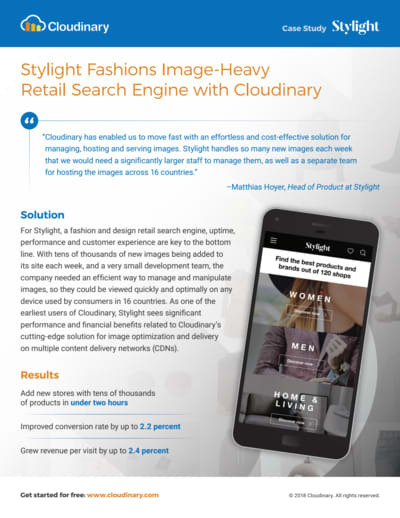 Stylight implemented Cloudinary as a key component of its search engine through which consumers in 16 different countries can shop online. Stylight features millions of products on its website, so when a new shop goes online, there could be 50,000 or more new products coming into the system that must be added to and displayed on the Stylight site. “Without Cloudinary, we could not do this efficiently, since we only have five developers who are responsible for scaling all the images and ensuring they display correctly on the site,” Hoyer said, noting that the company reduced the time it takes to go live with a new store in under two hours. But efficiency of the team isn’t the only benefit of using Cloudinary. Stylight has seen impressive results in performance in the countries it serves. Lazy loading has sped up page load time by about 100 milliseconds across all locations, enhancing the user experience. A better user experience has improved the click out conversion rate (COCR) anywhere from .4% to 2.2%, depending on the country. COCR is a measure of the number of clicks on products and redirects to partner stores during a given session, and has a direct impact on Stylight’s revenue, since it is tied to the compensation they receive from their partner stores. In addition, Stylight has seen its revenue per visit grow between .5% and 2.4% in various countries. Many of these results can be traced back to leveraging new technologies to optimize performance. “Cloudinary is at the forefront of adopting cutting-edge technologies, and quickly implements them into their solution. We don’t have to invest in learning more about new technologies or implementing them ourselves, since we know Cloudinary will do it,” Hoyer noted.